Hurricane Irma made landfall in Florida on Sunday, raking the lower Florida Keys with 130 mph and soaking the southern part of the state with torrential rains. Irma touched ground in Cudjoe Key at 9:10 a.m., the National Hurricane Center reported. The system, which has already knocked out power to almost 500,000 customers across the state, was expected to churn-up life-threatening storm surges of up to 15 feet along parts of southwestern Florida and on other parts of the coast, forecasters warned. Storm surges were beginning to impact Key West just before 4 a.m. ET Sunday, with water levels already two feet above normal. "Life-threatening storm surge is occurring now in the Keys and is expected to begin this morning in Southwest Florida," Florida Gov. Rick Scott tweeted early Sunday. More than 490,000 customers were without power in Florida early Sunday, according to utility companies including Florida Power & Light. Irma restrengthened to a Category 4 storm early Sunday as it hit the lower Florida Keys with maximum sustained winds of 130 mph just after 7 a.m. ET. It could reach Fort Myers by Sunday night, passing the Tampa Bay area before moving to northern Florida on Monday morning. The Florida Keys and the southwest Florida coast are in the most danger of storm surges of around 10 feet. The Keys could get between 10 and 20 inches of rain, and the Florida peninsula could get 8 to 15 inches. Tornadoes are possible. In Miami Beach, streets were already submerged after torrential rain. Nearly 6.3 million people were ordered to evacuate ahead of the storm. Not everyone heeded the calls. Brian Cone, a boat captain in Tavernier in the Florida Keys, said he is staying at home, which he said is built of cement and which he compared to "a bunker." "Truthfully, the whole state of Florida is in trouble. I mean, there's really nowhere safe," Cone told MSNBC in a phone interview. He said he and his neighbors have generators, batteries, food and water and other supplies. "We feel it was more dangerous to travel all over the state, run out of fuel possibly ... We're gonna ride it out," Cone said. The NHC said late Saturday that "heavy squalls with embedded tornadoes" were sweeping across southern Florida. One touched down near Fort Lauderdale, the National Weather Service said. The fire department said there was no damage or injuries. Key West Police Chief Donald Lee told MSNBC by phone Saturday that those who stayed in defiance of evacuation orders do so at their own risk. He said the area had already seen tornado warnings, downed trees and flooding by Saturday evening, and the storm could be devastating. "They're putting their lives in danger," Lee said. 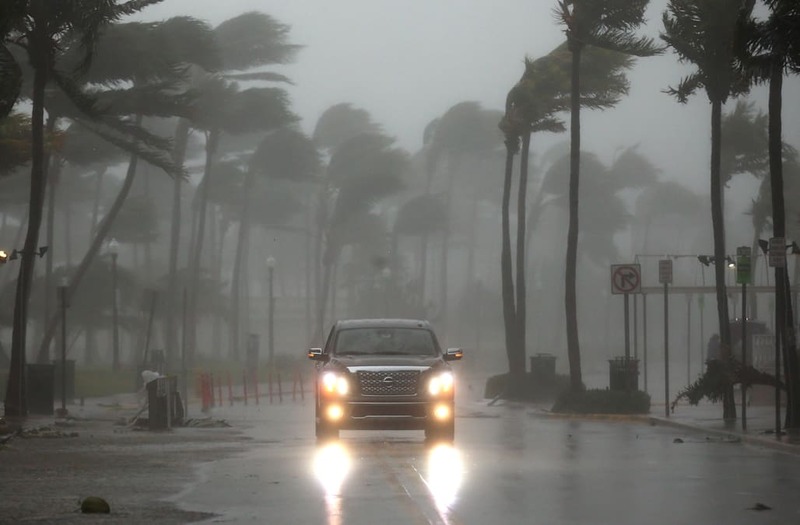 In Miami-Dade County in the southeastern part of the state, police encouraged residents to stay indoors as the storm was hitting early Sunday. "There’s a lot of trees that are being knocked over, we have live wires — it’s extremely volatile out there,” Miami-Dade Police Department Major Hector Llevat said. "Right now, we’re just urging everybody to stay indoors, to seek shelter." Scott said Sunday his chief worry was the storm surges, which may reach as high as 15 feet in southwest Florida. "It's hard to believe anybody will survive that," he told NBC News' TODAY show. Scott said he would not spare any resources to protect people from the storm. “We’re going to take care of everybody,” he said. The hurricane center warned of a storm surge of up to 10 to 15 feet between Cape Sable and Captiva if they peak at high tide, and storm surge of up to 5 to 10 feet in the Keys. Tampa Bay could see surges of up to 5 to 8 feet. Scott said Saturday that Florida has been "aggressive" in its preparation for Irma, adding that there were more than 385 shelters open across the path of the storm. Meanwhile, north of Florida, states were also preparing for Irma's arrival. In Georgia, 540,000 residents were told to leave the coast, while in South Carolina, nearly 45,000 people were ordered to evacuate. Hurricane Irma has already claimed at least 23 lives after smashing through a string of Caribbean islands this week, including Barbuda, St. Martin, the U.S. Virgin Islands and Puerto Rico, where 1 million people were left without electricity. Kalhan Rosenblatt reported from Plantation, Florida and Saphora Smith reported from London.